P.S. We got a genius tip from one of our Facebook fans this week. She used our silicone liner and found a great way to keep them steady and open before you pour. Use paperclips to hold the liner against the mold and they won’t leave any marks or lines on your soap. Thanks, for the tip Margo! This week’s photo comes to us from Emily from Suds by the Sea. 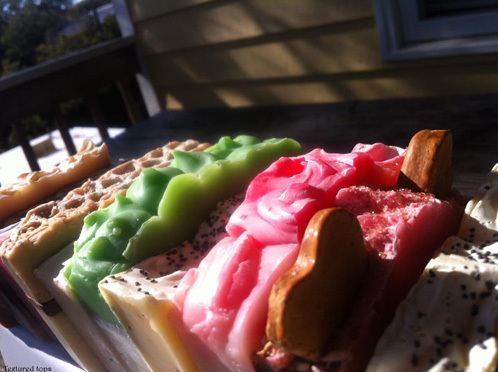 Emily submitted this beautiful variety of her cold process soaps to Bramble Berry’s Facebook page and I just had to share them. From pinks to green and browns, these soaps popped right out. I also loved the photography and composition of the photo and thought the natural lighting was fabulous! You can check out her other soaps (and the cute island theme she has going) on her blog and facebook page below. 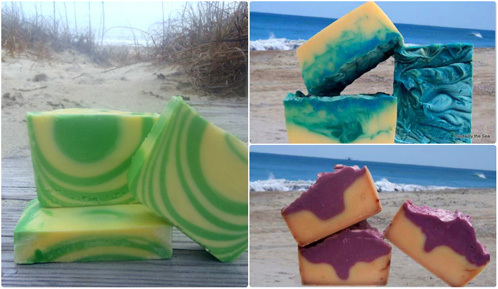 Thank you so much, Emily, for being a part of our soapmaking community on facebook. We can’t wait to see more from you and expect a special little package to be heading your way. I purchase Emily’s soap at the beach in North Carolina. i am so happy that she won! She works hard and is always improving her soap-making skills. She is an awesome person and a very good soap-maker. Thanks, Emily for sharing your talent. Congratulations! Lovely soaps! The pictures are beautiful! Congratulations! Very nice! And what a great way to reinforce the name of your company, Emily. Thank you. We love living here. 🙂 You’re welcome to visit if you like.